Thank you for your interest in Hawaiian Wildlife Tours, which was founded to promote environmental education and encourage conservation in Hawaii. Dr. Jim. (Ph.D. in Zoology, Univ. of Hawaii, 1971) provides custom tours of Hawaii's unique and beautiful ecosystems, focusing mainly on endemic species of plants, birds, reptiles and mammals. Personalized bird watching, nature photography, and family tours can be arranged to meet your special interests and abilities. I lead personalized tours, just you. I try to develop a tour package that meets the interests and hiking capabilities of my clients. I have a broad background in the natural history of the Hawaiian Islands and enjoy sharing my love for the islands. In addition to birding, I also take clients out to see rare and endangered Hawaiian monk seals, hoary bats, and green sea turtles. In winter season (February-April) we can go whale watching from the shore and see Laysan albatross chicks in their nests. Reservations should be made at least a month in advance. Because of the vagaries of the weather, I usually reserve a couple of days for each client so that we are not forced to go out in the pouring rain. My rate is $50 per hour for a couple, and we usually go out for 4 hours in the morning. Please contact me if you would like any additional information. We always strive toward wildlife conservation, and are opposed to the spread of non-indigenous species that affect Hawaii wildlife. Read about the issue of weasels in Hawaii. 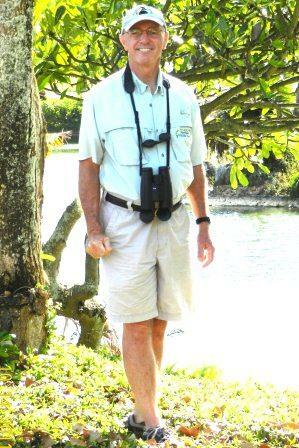 A naturalist and bird watcher all my life, I returned to Kauai after 19 years on the mainland. There I was a university professor (City College of New York) and later a research scientist (Harvard University and Marine Biological Laboratory, Woods Hole MA). I had received my Ph.D. in Zoology from the University of Hawaii in 1971, specializing in animal behavior and ecology. Back in Hawaii, I re-discovered the natural wonders of its forests and wildlife. I started Hawaiian Wildlife Tours in 1996 to share my appreciation for the culture, beauty and mystery of the Hawaiian Islands. Member: American Birding Association, Ecological Society of America, The Explorers Club, Western Society of Naturalists, Hawaii Audubon Society, Hui o Laka.